In honor of this year’s Earth Day (April 22), we looked for ways local venues are minimizing their environmental impact. Here are three places where you can fill your cup without filling the landfill. 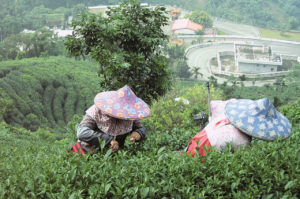 Gong Fu Tea’s owners travel to central Taiwan and other locations where tea is grown so they can assess the quality of the working conditions, product and manufacturing process. To build their repertoire of 150 teas, Mike Feller and Rusty Bishop, Gong Fu Tea co-owners, go to the motherlands. “We source our suppliers of tea leaves by traveling to the tea lands, comparing the suppliers and their practices, and sampling their offerings,” Feller says. “This way, we can choose the teas we enjoy most while assuring the quality of the product, the working conditions for the employees and the purity of the manufacturing process. Gong Fu partners are smaller-scale, chemical-free and biodynamic (think organic plus a focus on the link between the lunar cycle, plants and animals). “We focus on these factors less for marketing and more because they just make good, sustainable business sense,” Feller says. Penna and Ho pride themselves on more unique offerings than pumpkin spice lattes, with a focus on beans that have particular qualities, such as brightness or fruit-forwardness. All menu additions are based on seasonality, diversity and quality. For Jared Giunta, the beverage director at Proof, and his team, being green is all about minimizing waste. “We utilize excess from garnishes for shrubs [sweetened vinegar syrups used to add complexity to drinks] and juice all zested fruit rather than tossing it,” says Giunta, who crafts cocktails at the Western Gateway restaurant in partnership with Karli Sandos. Come spring and summer, Giunta and Sandos lean into shrubs and fruit syrups to make the most of scraps. They also transform leftover red wine into vinegar and employ extra white wine in shrubs. Even straws reflect the restaurant’s eco mission. “We work with a local glass-blower so we can offer glass Pyrex straws that can be dish-washed and polished like a wine glass,” Giunta says.